You love espresso, and that’s great because Nutrition You Can Use details the many health benefits of your daily dose! But do you know what espresso really is? If you don’t, consider this your crash course. If you answered anything other than “Process” you’re not alone! In truth, any type of coffee, roast or grind can be used to make espresso. Some make better espresso than others, but what makes espresso espresso is the process of extracting. Adhering to those benchmarks will give you true espresso. Coming close will give you something close to espresso. With that in mind, let’s quickly look at the two main types of espresso machines: steam and pump. Our #1 Krups espresso machine, the XP1000, is a steam machine. Number 2-5 are pump espresso machines. Steam espresso machines are essentially electric versions of stovetop espresso machines, such as Bialetti Moka Pot. Because they don’t have pumps, pressure is generated by creating steam in a confined space. Unfortunately, this pressure is below the aforementioned 9 bars for a true cup of espresso. The XP1000 below is able to generate 4 bars of pressure. Pump espresso machines are able to meet all of the criteria above and produce a true espresso with a rich crema. So, how could we rank a steam espresso machine #1? The XP1000 is an inexpensive entry-level espresso machine and will produce a very espresso-like beverage. While it isn’t true espresso, and I’ll detail some shortcomings in the Quality of Espresso section below, it gets you almost all the way there for a fraction of the price. If you truly want the best Krups espresso machine, try our #2 ranked machine. While not the tip-top best Krups espresso machine, the XP1000 Steam Espresso Machine is the best combination of performance and price. Brewing a consistent espresso beverage requires precision, as you have to control the amount of water you add for each brew and adjust for whether you want to steam milk, but in the end that really gives you total control over the end result. The Verdict: Get a rich espresso-like beverage, albeit without a good crema, for almost half the price of an entry-level pump espresso machine. The Krups XP1000 Espresso Machine is designed for simple, compact brewing. It heats up quickly, is incredibly quiet, has a capable built-in frother and won’t set you back half-a-grand. OK so I suppose simple is a relative term. Without a doubt, the Krups XP1000 is more complex than a Nespresso machine that runs on capsules. You’ll need to measure out your coffee beans, grind and tamp them properly and add the right amount of water. Related: Read The Coffee Maven’s Nespresso Pixie review. Oddly, though, the Krups XP1000 doesn’t come with a tamper. Krups says you can use the back of the included scoop to tamp your grounds, but it doesn’t work too well if you only have enough for one serving. For all but the most seasoned home baristas, it’ll take some time to master this machine. The good news? There aren’t a ton of hard-to-use features. Really the only inputs are the volume of water, the type of grind, the volume of grounds and the degree of tamping. And because this Krups espresso machine brews the volume of water you add to the tank and not some pre-set amount, you really do get total control over your beverage. The trade-off is that you need to be precise to get the same brew over and over. This isn’t a pod coffee maker, like a Keurig or Nespresso machine. Make sure your grind size, volume of water and grounds and degree of tamping are consistent each time to ensure similar results. All told from start to finish, you can expect to take 12+ minutes for a full 8 oz espresso. Note: The instructions say to froth the milk before making your espresso, but that will leave your steamed milk sitting/cooling for longer than I’d recommend. The 14 oz water reservoir feeds both the espresso maker and steaming wand, which means you’ll need to add 1-2 oz of water for steam in addition to the volume for your brew. For example, for a 6 oz espresso you should add about 8 oz of water. Note that for best frothing performance, you should only use 1% or 2% milk. Compact and attractive, I love the look of the Krups XP1000 espresso machine. Its matte design is easy on the eyes and easier to keep clean, and the rounded, well-built look gives it the appearance of a reliable espresso machine — which it is. The plastic exterior is fairly scratch resistant and durable enough to take a beating, and I had no issues with it over several weeks of use. In my supplemental research about the worst complaint I came across was the on/off indicator light going out after 18 months. Should something happen Krups offers a 2 year warranty on the XP1000, which is pretty good for a kitchen appliance these days. 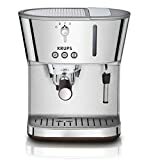 As mentioned in the intro, the Krups XP1000 is a steam espresso machine. That likens it to a stovetop espresso pot, such as a Bialetti, meaning you won’t get true espresso because it can’t get to 9 bars of pressure. However, the XP1000 gives you a rich, great tasting espresso-like beverage that rivals many of the four-figure machines on the market, but it struggles to get a good crema. Of course, if you’re brewing a cappuccino or latte, the lack of crema isn’t a big deal at all. Tip: You can try to get a better crema by using a finer grind. It still won’t be great, but you may be able to achieve better results. Experiment with different grinds, water/ground volumes and degrees of tamping to figure out which combination produces the best beverage for your tastes. Prior to first use you’ll want to run 1 or 2 full water-only cycles to flush the internal components. Sometimes you get that plastic or rubbery smell for a couple early extractions, but that’ll dissipate quickly. It’s also advisable you never run a cleaning agent through a Krups espresso machine. Instead, you can and should descale with a mixture of equal parts vinegar and water. Fill the water reservoir with 8-10 oz and run through with a full cycle. Then run 2 or 3 water-only cycles to rinse. Keep rinsing if the taste of vinegar is still present. I love the look of the dome-shaped cap to the water reservoir but man, is that thing hard to remove. During the brew process the combination of high heat and pressure and the water being suctioned out of the water reservoir really seals the cap on good. The rounded shape makes it difficult to get a good grip. With The Coffee Maven’s top-ranked espresso machine detailed above, allow me to unveil the rest of our top 5. Just about all you have to do is make sure the machine is filled with coffee beans, select the brew you want and pour your milk into the frother. The EA9010 comes with a 56 oz water reservoir and a Claris water filtration system, and it’s made in France with a 2 year warranty. Who is this machine for? Anyone looking for a do-it-all super automatic espresso machine. Click here to read the user manual. Though the Krups XP5220 isn’t super automatic, it is compatible with E.S.E and soft pods and can be had for much less than the XP9010. As a pump espresso machine, it also extracts a true espresso with a rich crema. The Precise Tamp system adds a degree of convenience and works as advertised — no hand tamping necessary. Of note, this machine does not come with a built-in grinder and does not have a large water reservoir. Instead, it has a cube-shaped “bucket” with a handle that you lift out, fill with water and lower back into place. It doesn’t have a large capacity. Who is this machine for? Anyone who wants true espresso for an affordable price and doesn’t mind the lack of an included grinder. The Krups XP4600 shares many of the same features as the XP5220 above, but it’s part of Krups’ Silver Art Collection series and boasts 100% stainless steel components. The XP4600’s 1450 watt thermoblock heating element is 50 watts higher than that of the XP5220, but both get the job done equally well, making the XP5220 a touch more efficient. Overall the XP5220 and XP4600 are nearly the same, so I’d go with whichever is less expensive. Who is this machine for? Anyone looking for the classic stainless steel look or, like the XP5220 above, anyone who wants a true espresso for an affordable price but doesn’t mind the lack of an included grinder. I’ve used this machine and enjoyed the espresso it makes, but I didn’t put it through years of regular use. My supplemental research with those who have noted a grinder that quits after about 2-3 years. If I’m buying super automatic, I’m going for a four-figure, top-of-the-line machine. In this price range give me a high-quality, metallic pump espresso machine and I’ll do the grinding on my own. That said, this is a popular Krups espresso machine and there are people for which it’s the right machine. Who is this machine for? Anyone who wants affordable super automatic performance, probably those who have never owned a super automatic espresso machine before and want to test run the Cadillac of coffee convenience.